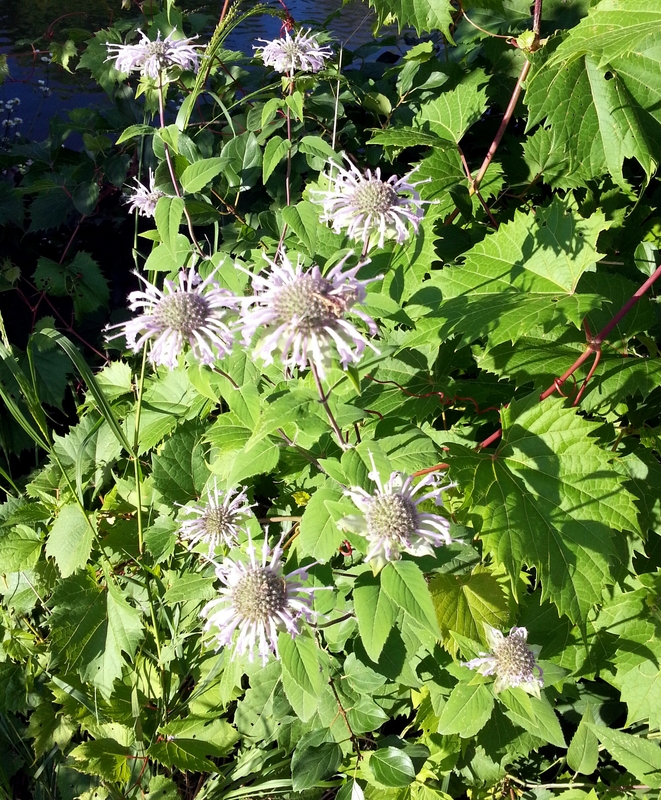 The flower is reminiscent of a pincushion, but with many tubular petals (each actually a flower in its own right) instead of pins. You can see the “pincushion” shape a bit better as the flowers/petals begin to fall off, leaving a bald spot at the center. 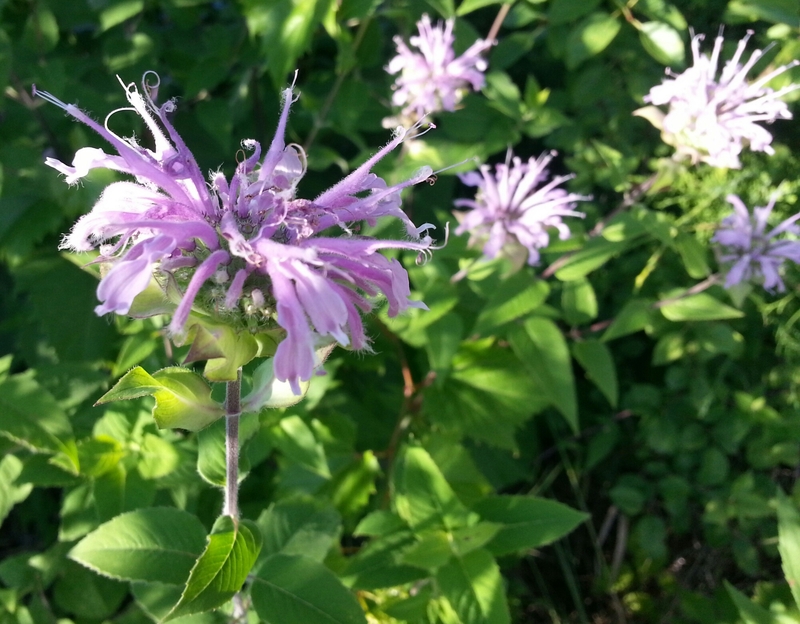 Monarda fistulosa tangled up with wild grape vine. I continue to enjoy this plant immensely even after all the petals have fallen off. When I pass by one, I am rarely able to resist the urge to run a finger over the pincushion. This releases essential oils that smell akin to thyme or oregano, sometimes with a citrusy overtone. The essential oils last well into winter, when most of a garden’s vivid scents have disappeared. Dice half a small yellow onion (or red for more color), a 2-inch by 1/2-inch sliver of fennel bulb, and a 2-inch stub of the carrot you’ve been snacking on because hunger hit you before you’d started to even think about what to cook for dinner. Saute in hot skillet for a few minutes until onion starts to become translucent. 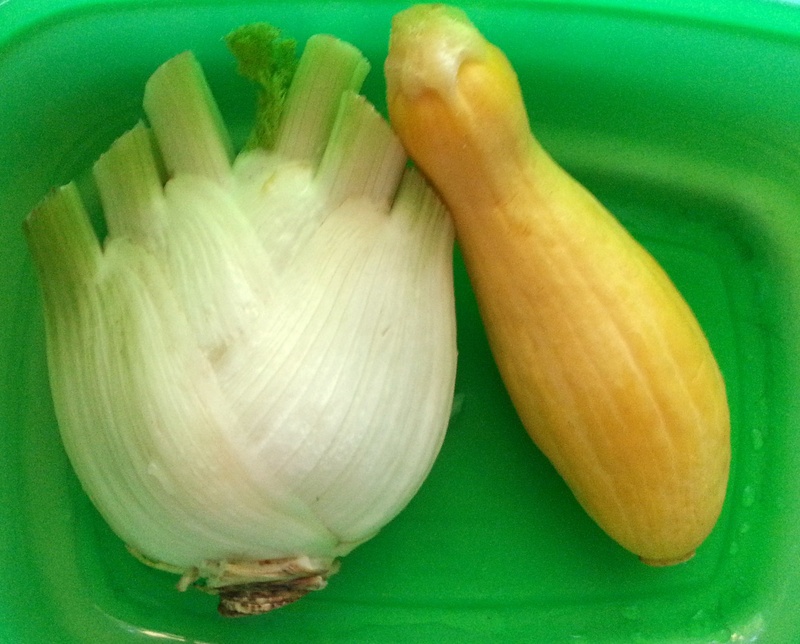 Add one small zucchini, diced (mine was of the yellow-skinned variety, but you’ll get more color from green). Continue cooking a minute or two, until zucchini is tender. 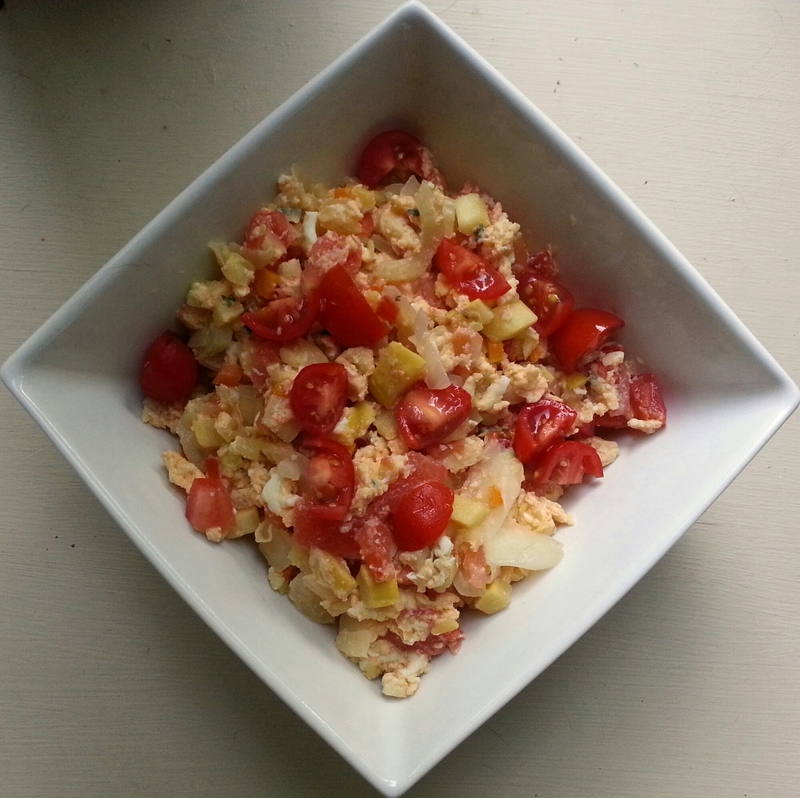 Add one eating tomato (3-4 ounces), chopped, and a few monarda leaves, sliced into tiny little slivers (1–2 teaspoons). Cook until heated through. Beat two eggs with two egg whites (3 or 4 tablespoons). Add a pinch of salt and some shredded cheese if you like. Pour on the hot veggies and stir every 30 seconds or so until the eggs are scrambled. This photo gives you a better idea of what the leaves look like than the one above, since a grape vine isn’t covering most of them. 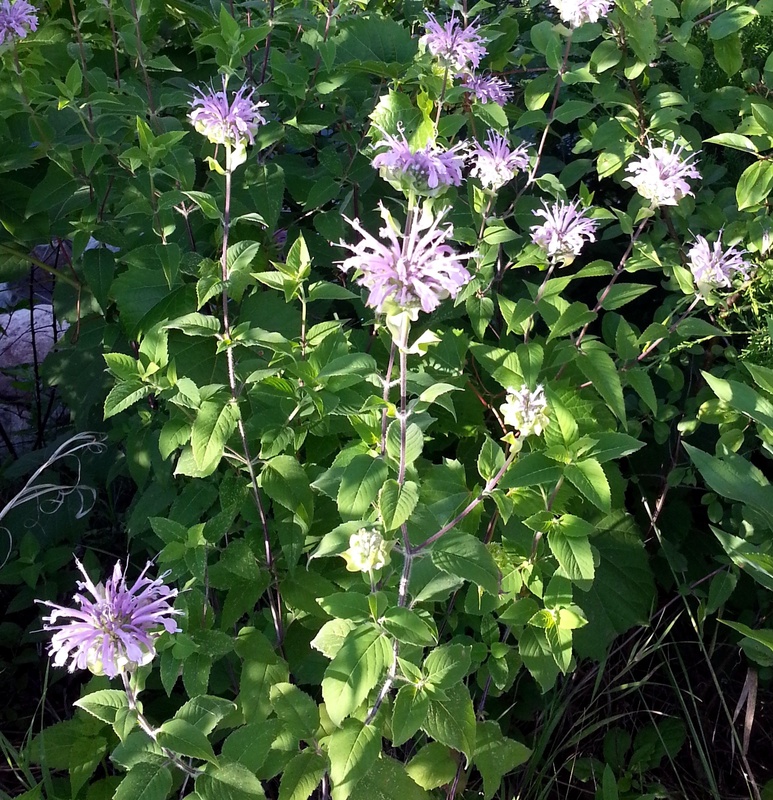 These monarda flowers blossomed more recently than the ones above, so haven’t yet started to lose their center petals.